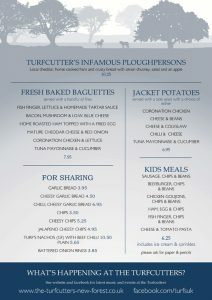 Here at The Turfcutters Arms we’re proud of our real ales and home cooked food. We have a varied and exciting menu using the freshest, seasonal and local produce that can be found from producers here in Hampshire. Our home made burgers (including our increasingly popular veggie version) are legendary and to them you can add your favourite extras including Lyburn cheddar, flat field mushroom, onion rings, free range fried egg, or local smoked back bacon. 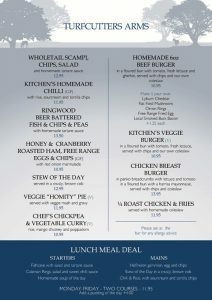 Then there’s our Ringwood beer battered fish chips and peas, or honey and cranberry roasted ham with free range eggs and chips. Plus there’s always a long list of specials on the board. We also serve a wide selection of fresh baguettes and desserts. As well as the ales of which we’re proud we stock a wide range of wines, bottle prices from £15.50 and a white, red or rose for all seasons and all palates. We haven’t forgotten about the kids. Child sized portions are offered on a selection of meals from the menu. We even cater for your four-legged friends. Bring your dog to the bar where they’ll get a tasty treat! We advise you to book a table in advance as we can get extremely busy.